Sprouted grains are a unique type of food that contains essential nutrients than regular grains do. This type of grain is different because it has already sprouted. This grain is just like a regular grain. However, it is one that has already started germinating. As such, when you look at it, it has a shoot sticking out of its surface. The sprouted grains are more nutritious than regular grains. This is because, in the process of germination, these grains used up the starch in their cotyledons to provide energy for pushing the shoot out of the soil. As such, other nutrients such as minerals, vitamins and proteins take up the capacity that had been used up by the starch and reach high concentrations in the sprouted grain. As a result, consuming this sprouted grain is better for our health than consuming regular grains. The benefits of eating sprouted grains are indicated below. The sprouted grains have begun the process of germination. As such, they have deactivated the enzymes that prevent the growth of the seed. As a result of this, they have higher amounts of vitamin C, iron and folate than regular grains do. Moreover, they have higher amounts of protein as well. In addition to having higher concentrations of nutrients, the sprouted grains have their natural plant enzymes. These are the ones that help with the digestion of the grains in the digestive system. Thus, it is easier for our bodies to digest sprouted grains than regular grains. Various sprouted grains have unique and very beneficial nutrients. For example, the sprouted sunflower grains have high levels of vitamins A and C. most sprouted seeds have high concentrations of phosphorus. This means that they help us to be more alert, mentally sharper and have healthy teeth and bones too. A great advantage of sprouted wheat is that when cooked, it does not cause the same allergic reactions that regular wheat causes. This is because after wheat is sprouted, the starch in it is turned into simple sugars. These can be consumed without causing any allergies to wheat intolerant people. The sprouted wheat also contains lower levels of gluten protein. Thus, products made with sprouted wheat have healthy levels of gluten. When we cook grains, the heat and the oils we use usually destroy the nutrients in the grains. Thus, we eat food that contains fewer nutrients than it should. However, when we cook sprouted grains, the nutrients are left intact for us to enjoy. The natural enzymes in the grains protect the nutrients from the heat in the cooking process. The sprouted grains promote colon health. The sprouted grains help to promote the growth of beneficial bacteria in our digestive systems. These bacteria maintain our health by keeping a safe environment for digestion and producing antioxidants that protect our digestive systems as well. 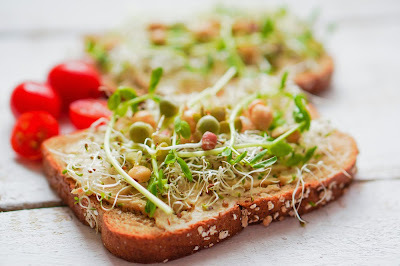 Bread that are made out of sprouted grains has higher levels of enzymes, protein and vitamins. In addition to that, the complex starch content in the natural bread is converted into simple sugars naturally. These bread are also low on the glycemic index (GI). This means that they are healthy to eat and complement a balanced diet. Also, bread made from sprouted grain is digested slower than regular bread. This means that it can maintain stable levels of sugar in the blood for longer periods of time. This makes the consumers feel full and comfortable for longer. This can lead them to snack less and less. This effect can make a positive contribution to those who want to lose weight. The sprouted broccoli have antioxidants known as sulphoraphanes. These are special nutrients that help the body to absorb insulin. Thus, they promote the balancing effects of insulin in the body. Moreover, they contribute to control the levels of blood sugar in the body. Sufferers of type 2 diabetes can benefit immensely from sprouted broccoli. Eating sprouted rice helps to maintain a proper level of cholesterol in the body. The sprouted rice increases the levels of plasma HDL – cholesterol in the body. This is the good cholesterol content. By consuming sprouted rice, we can reduce the risk of developing atherosclerosis cardiovascular problems. Consuming sprouted brown rice, nursing mothers can experience low levels of emotional imbalance. Their psychological condition is significantly improved, and their immunity is promoted as well. Nursing mothers who consume sprouted brown rice can have lower levels of depression, tiredness and anger. They also develop higher levels of s-IgA in their bodies. This indicates increases in their immune systems. The liver can develop fat around it. This can be as a result of disease such as alcohol-induced cirrhosis. If you consume sprouted buckwheat, then these grains can reduce the symptoms of fatty liver. This is because, the Buckwheat contains rutin and quercitin. These both reduce inflammation in the liver. Overall, sprouted grains have very many benefits to our bodies. Ella James is pursuing Health Services Administration degree from St. Petersburg College. She also enjoys reading articles related to Health, Fitness, and Technology. She specializes in writing articles about Health, Beauty, Pregnancy, and Skin Care Treatments to be precise she loves to share her years of experience in Women’s health category. She is contributing to Consumer Health Digest since 2013. Connect with her on Facebook and Twitter. Such an informative blog post but can you be able to eat sprouted groundnut and mango? Is it possible to get a sprouted grain here in Nigeria? Yes, sure it is easy to get them..just go to the nearest mall.